In an electric mixer mix the flour and salt. Slowly add the yolks. Mix until blended. Cover dough with plastic wrap and rest 20 minutes. 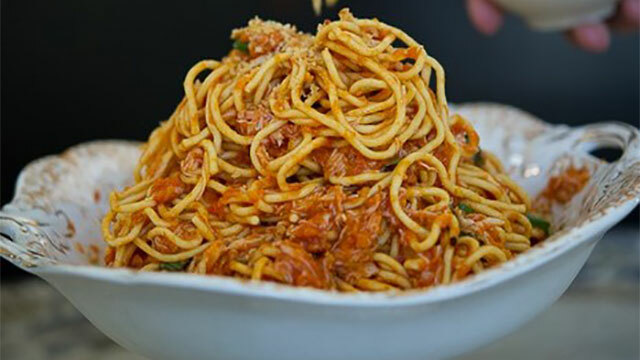 Using a pasta extruder, follow the machine’s directions to form spaghetti. Dry spaghetti is a fine substitution. In a sauce pot, heat the extra virgin olive oil; add the garlic, onion, crushed red pepper, fennel seed. Cook until soft. Add the plum tomato and the shellfish stock. Season with salt and pepper. Remove the sauce from the heat, puree using a stick blender or food mill. Check seasoning and add the crab meat and torn basil.